The grain boundary attack occurs at high alloyed, austenitic or ferritic, chromium and chromium nickel materials, under unfavorable conditions at the pickling. 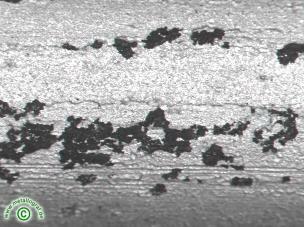 Predominantly carbide precipitates on the grain boundaries are responsible for this corrosion form. The grain boundary attack can lead fast to intercrystalline corrosion if the material to be pickled was heat treated for example badly , the pickling agent shows a not suitable composition , or the pickling time is too long .